Boston, 1769: Ethan Kaille, a Boston thieftaker who uses his conjuring to catch criminals, has snared villains and defeated magic that would have daunted a lesser man. What starts out as a mysterious phenomenon that has local ministers confused becomes something far more serious. A ruthless, extremely powerful conjurer seeks to wake the souls of the dead to wreak a terrible revenge on all who oppose him. Kaille's minister friends have been helpless to stop crimes against their church. Graves have been desecrated in a bizarre, ritualistic way. Equally disturbing are reports of recently deceased citizens of Boston reappearing as grotesquely disfigured shades, seemingly having been disturbed from their eternal rest, and now frightening those who had been nearest to them in life. But most personally troubling to Kaille is a terrible waning of his ability to conjure. He knows all these are related...but how? When Ethan discovers the source of this trouble, he realizes that his conjure powers and those of his friends will not be enough to stop a madman from becoming all-powerful. But somehow, using his wits, his powers, and every other resource he can muster, Ethan must thwart the monster's terrible plan and restore the restless souls of the dead to the peace of the grave. Let the battle for souls begin in Plunder of Souls, the third, stand-alone novel in Jackson's acclaimed Thieftaker series. D. B. JACKSON was born in one of the thirteen colonies and now lives in Tennessee. 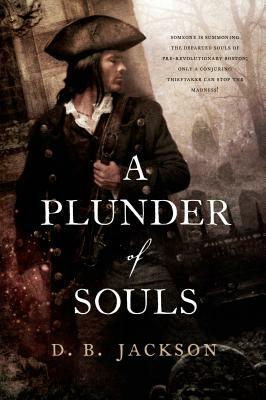 A Plunder of Souls is his third novel in the Thieftaker series.